A good U.S.A. made spark plug. Won't pass judging standards if you are showing your car but for the driver, the price can't be beat! Plug comes with gasket and screw on caps. Gap at .035 - .038. U.S.A.
Champion 18mm Spark Plug, for the 1933-37 Flathead V8, 21 stud engine. Autolite 18mm Spark Plug, for the 1933-37 Flathead V8, 21 stud engine. Autolite 14mm Spark Plug, for the 1938-53 Flathead V8, 24 stud engine and 1941-53 six cylinder engine. Champion 14mm Spark Plug for the 24 stud 1938-53 Flathead V8 Engine and 1941-53 six cylinder engine. 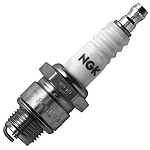 NGK 14mm Spark Plug for the 24 stud 1938-53 Flathead V8 Engine and 1941-53 six cylinder engine.